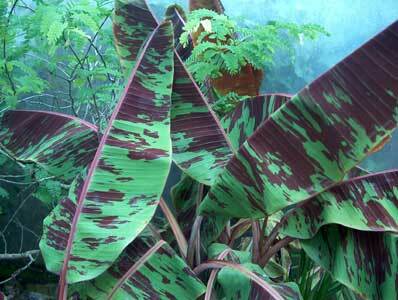 Musa Zebrina: The Blood Banana. Slender 2m plant with vivid oxblood-red splashes on the upper sides of the leaves, and maroon red undersides. Stunning feature plant for a sheltered warm corner. This month it is on special for $15.00 - save $5.00!